Ingmar Bergman's life-affirming story of the Ekdahl family would be his last feature film. No one ever made a better exit. Embassy Pictures/courtesy Everett Collection Fanny and Alexander, Bertil Guve, 1982. Stars: Pernilla Allwin, Bertil Guve, Borje Ahlstedt, Lena Olin, Harriet Andersson, Anna Bergman, Erland Josephson, Mats Bergman. Ingmar Bergman announced that this life-affirming story of the Ekdahl family would be his last feature film. It was, and no one ever made a better exit. 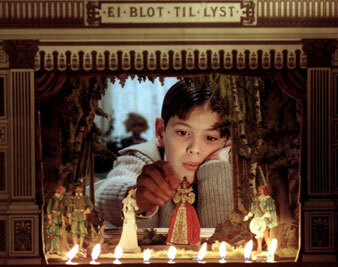 Fanny and Alexander, Ingmar Bergman declares, is his final picture, and the temptation is to call it his Tempest. He has placed a theater at the center of the screen and reminds us that within “this wooden O,” invention can give shape to the chaos of our existence. Like Shakespeare, Bergman bids farewell with a romantic tale that fairly shouts its affirmation of life, an affirmation that acknowledges pain, cruelty and the terror of mortality, but drives back that darkness with a blaze of vitality. It smiles at its characters’ follies but cherishes their valor, and in their behalf it employs magic with the casual authority of Prospero himself. The children of the title belong to the Ekdahl family, presided over by their grandmother, Helena Ekdahl. Fanny is a solemn little girl of 8, whose principal characteristic is a protective devotion to her brother, Alexander, age 10. He is the sort of boy whom one discovers crouching in a corner or beneath some large piece of furniture, peering out at his surroundings in undefined alarm. Alexander’s imagination, so vivid as to constitute almost a sixth sense, has earned him a reputation for lying. The film’s brushes with the supernatural are associated with him. The Ekdahls are the leading family of their prosperous provincial town and the proprietors of its theater, built when Helena, a young actress of national reputation, married into the family. She managed it successfully for many years, but when she was widowed, she turned it over to Fanny and Alexander’s parents – Oscar, her eldest son, and his wife, Emilie, its current star. Oscar is a poor actor but an astute manager, and the theater prospers. He has two brothers. Gustav, who runs a restaurant on the theater premises, is a handsome, high-spirited man with a weakness for young women. His present interest is the rosy nursemaid, whom he tumbles exuberantly, to the indulgent amusement of his wife and mother. Carl is a professor and looks the part, but he is crippled by timidity and self-pity. He drinks and berates his wife. Helena watches over this clan with a solicitude tempered by experience. Her closest friend and confidant is Isak Jacobi, a wealthy Jewish antique dealer who was once her lover. He is a cultivated man of exquisite manners, capable, when the occasion arises, of resolute action. We learn much of the family history during the Ekdahls’ Christmas party, which opens the movie. It is a festivity of unselfconscious opulence, such as was still possible in 1907: splendid rooms turned golden by candlelight, innumerable servants in crisp uniforms mingling with the feasting and dancing guests. However, at moments the innocence parts like a curtain, to reveal discordant scenes that foreshadow the year to come. I won’t disclose the plot. The story ebbs and flows like the seasons that pass across the screen. It contains death and birth, terror, hope and triumph. It is infectiously comic and repellently brutal. Bergman shows men and women at their worst and at their best; he has mercy for wickedness, compassion for weakness, and he rejoices in virtue. His understanding is keen, but he leaves room for mystery. Fanny and Alexander is an earthy tale of fabulous beauty. The cast is drawn from the aristocracy of the Swedish stage and screen. I can mention only a few of the players: Gunn Wallgren (Helena), Alan Edwall (Oscar), Eva Froling (Emilie), Jarl Kulle (Gustav), Erland Josephson (Isak Jacobi). Bishop Edvard Vergerus, a man of intolerable piety and pride who almost destroys Emilie, is portrayed by Jan Malmsjo; his tattling and neurotic kitchen maid by Harriet Andersson. Alexander is played by Bertil Guve; Fanny by Pernilla Allwin. Under Bergman’s direction this cast works with an ease and homogeneity of style that one rarely encounters except in a great repertory company.